Earlier this week I took the film into school so that any children who wanted to look at the film were able to. We made a little dark room using blackout material to be our cinema. It was very intimate, only four at a time could squeeze in, but I really liked this as it meant there could be a bit of chat as the film was showing, but without it getting too distracting. The small dark space combined with light being projected through the small projector was exciting, and there was a lot of experimenting with the beam of light in terms of creating shadows. I was surprised that no children wanted to leave before the end, some watched it a few times. I thought that it would not hold their interest as there is little narrative and the action is quiet, with most of the film close-up of the objects themselves. The responses I get were all very direct, often in the form of questions: Is that your hands? ; Did you draw that white stuff on the ground? ; Why are you hotting up all the things? ;Did you put the record player on so you could pretend it was the birds that were tweeting? These questions were at the heart of the decisions that I made when making the film. I was surprised as I think I expected the children to be more confounded by a film that was so different to ones they were used to. They also made connections with different things, for instance talking about bats, because of the dark room, and also about watching scarey films. When the candles started to burn low a few groups started to blow at the screen, Ellis commented on this “they can’t really blow them out they are on the computer. When I explained that I lit the candles to to make the objects bright, Ashton asked “to make them alive?” and I felt very pleased that he seemed completely in tune with my intentions. What happens in a basket. In November I reflected on how quickly one thing can become another. I have been thinking about the qualities of the container and how these can help transform objects into something else. A basket for instance has a nest-like quality. Leila put these tucked these two dolls up in a basket. But nest are also places in which to store what you have collected. A store house to live in. Like the nest/basket of Daniel’s with two birds sitting on a pile of pen lids, collected from the drawing table. Magpies collect things in their nests, and Caddis flies actually make their nests out of things they have collected. Our houses aren’t made of things we collect, but they are containers for what we collect. When things go in a basket they also can become like a bowl, their rounded sides become good for stirring. 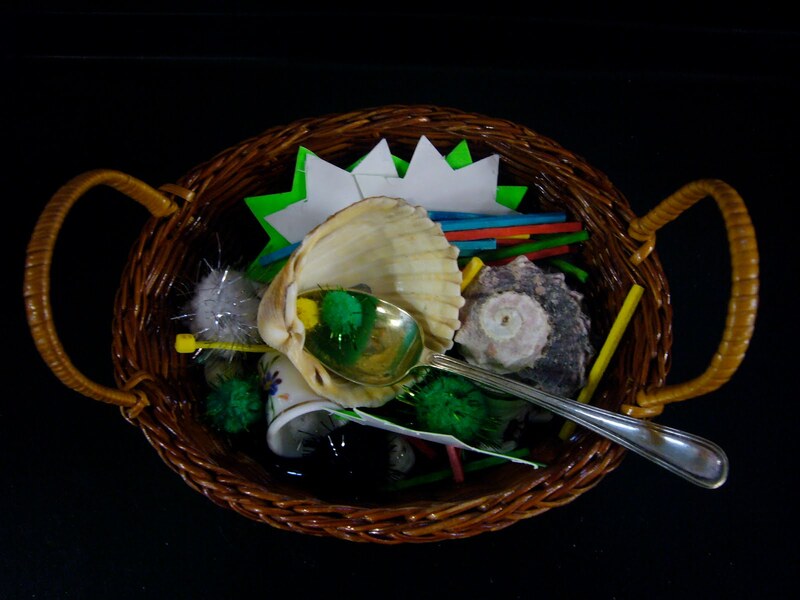 Spoons help baskets to become a space in which to mix things up. Things in baskets often become things to eat. Since the children have started to take photographs themselves some interesting things have happened. First, children are quickly picking up techniques (and often they pass this knowledge on to others, showing them how to use the camera). I heard Robyn telling someone to stay still; “because otherwise it’ll be all blurry”, and as she said blurry she waved her hand about to demonstrate what she meant. Jo asked Amber how she knew she was ready to take the picture and Amber said it depended on what she was photographing, if it was an object she tried to make sure all the sides of it were inside the LCD screen, but if it was a picture of the room, she made sure the picture looked how she wanted it to. Also very soon some children wanted to take pictures of other children. I noticed on a couple of occasions that a child protested about having their picture taken and I reminded the person with the camera that taking a photo was like taking something away from someone and that they had to ask first. Some children said no when they were asked, and then the photographer just asked someone else. I talked to Jo about taking pictures and we wondered if taking a photograph is a kind of collecting. I have now started to get the children to download the pictures to a computer so they can decide which of their photos they keep and which they delete. Last week my thoughts were all about ownership and wanting an object. I am beginning to see that certain children are attracted to certain kinds of objects. Some objects seem to be powerful agents: the piece of cloth to rub chalk out on the blackboard, my camera, the chalet music box, my laptop. Not all children are especially attracted to these, but they do seem to be desirable objects and things that particular children will grab out of someone’s hand. My job has become one of reminding children that they must ask if they want something that someone else has. If there is conflict over the objects (and there often is when someone has grabbed something from a tray, or out of a hand) I help to resolve this by restating the need to ask before taking. I also say that when you ask, the person will not necessarily want to give the object over. However I find myself being surprised at how often the children are able to negotiate taking an object from someone else, either when they say how much they want it; or by exchanging something else instead. The trays and the baskets have become a kind of boundary of a temporary collection. Leila called me outside to “look at my collection”, which turned out to be pieces of ice collected from inside the tyres outside, that she was placing on a tray. Other children started to take bits of ice from her tray and she became upset. We talked about needing to ask her first Soon other children were making their own ice collections, and some let others have pieces from their collections. I am thinking that it is important to have precious objects to handle and play with whether they are bits of ice or cameras even if its hard managing the conflict and the need to look after the object itself. But it needs so much time and patience, things that adults like me don’t have enough of most of the time. Today I was fascinated at the way the objects became one thing and then another. I had started to get used to the idea that the small objects in the draws were good for making flat arrangements on the trays; a kind of temporary collage that could be captured in a photograph before the things were put back in their draws. 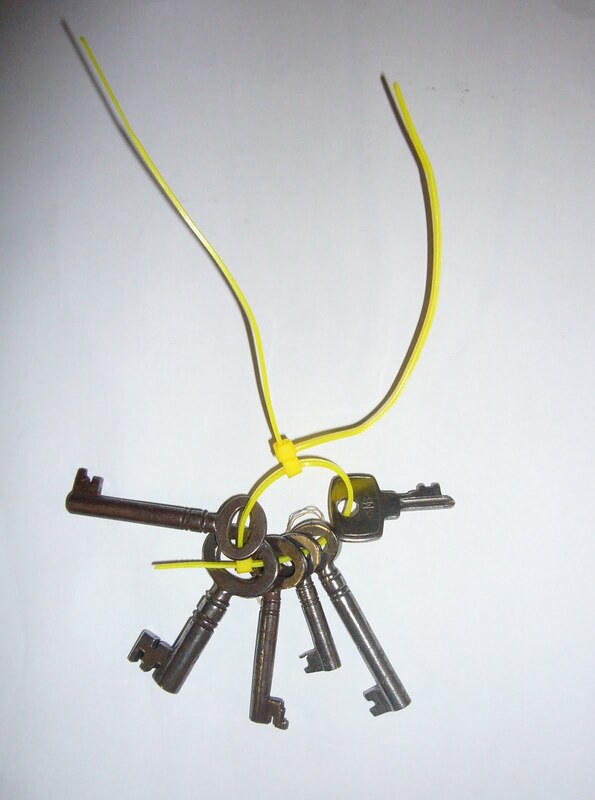 However, a few children began to use the yellow wirey sticks to thread buttons onto and then this turned into threading keys, so the keys ended up on a key ring, the shape of the key leading to it being right for threading onto a ring. 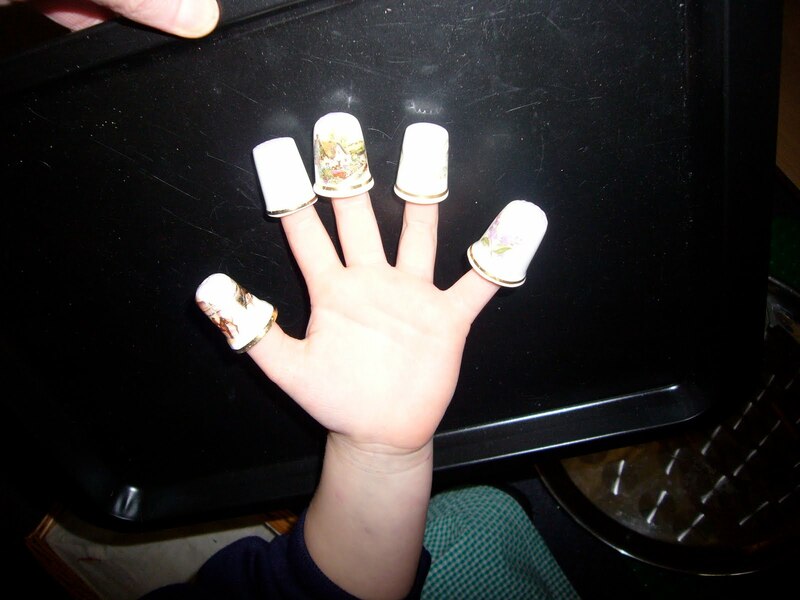 Just like the thimbles which were often being put on fingers; thimbles are for fingers of course. But then someone suggested they use the thimbles to be money, as it was like a shop and objects were being collected in baskets for buying. “No, they can’t be money, they are cups” was the response. Next thing the spoons were stirring all the things in the basket and suddenly there was food cooking, and I was being offered food to eat. “Here eat this bear” as I was offered a small teddy bear to eat. Everything is so fluid, one material becomes somethings else, and the stories that are told are always on the move.